Look around. There’s Something Happening Here. “Here” is as large or as small your event requires, from Hall 2 at 125,500 sq. ft. to our intimate 530 sq. ft. Aquarius Room in our Conference Centre. Whatever space you choose, you can be sure you’ll be supported by our team of inspired professionals who share a culture of service, hospitality, and dedication. The International Centre is proud to be the recipient of the M&IT Readers’ Choice Award. The International Centre has been recognized as the leading venue in Central Canada that exceeded Canadian meeting & event planners’ expectations! Free onsite parking for over 5,000 vehicles. It is the policy of The International Centre to provide a smoke-free and vape-free environment for its staff, tenants and visitors. We ask that you not smoke, vape, or use any tobacco products inside the facility. To view Peel Region By-law on waterpipe smoking click HERE . 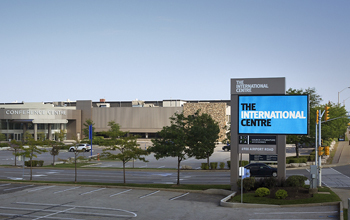 Your show or event is seen by over 40,000 unique visitors who visit The International Centre website each month. The Events Calendar page features a link to your website as well as general show information such as ticket pricing and entrance location(s). Catch the attention of over 61,000 daily commuters while we advertise your event on two, double-sided 10' X 20' LED entrance signs, prominently located on the busy Airport Road. These signs will be capable of displaying all forms of digital content, text and graphics to full-motion video. Expand your reach by taking advantage of our comprehensive social media resources through The International Centre’s Twitter and Facebook campaigns.